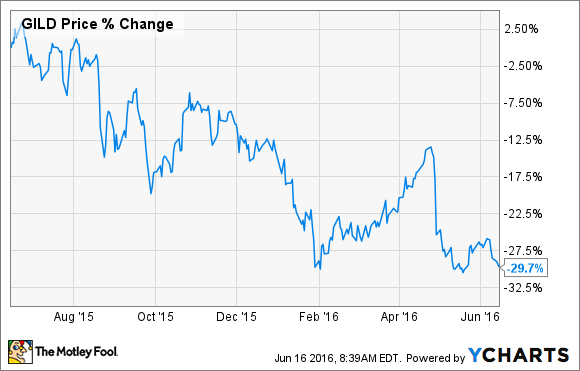 Gilead Sciences: Where's the Value? Here's why Gilead can't break out of its year-long slump. Over the past year, Gilead Sciences' (NASDAQ:GILD) shares have steadily marched lower due to the flattening sales of its hep C drug Harvoni. The mystifying part about Gilead's yearlong decline is that its other hep C drug, Sovaldi, has actually seen its global sales increase, and the biotech has also launched three major new TAF-based HIV drugs over this time period: Genvoya, Odefsey, and Descovy. The net result is that Gilead now sports a PE ratio of 6.7 -- the lowest of all blue-chip biotechs and major drug-manufacturers, illustrating the market's extreme pessimism toward this large-cap biotech stock. Why can't Gilead get any respect? In light of the market's dour outlook, I think the only forward-looking scenario that even begins to make sense is if the hep C market is about to see yet another major drop in prices -- presumably as a result of the launch of Merck's (NYSE:MRK) new drug Zepatier. After all, Merck drastically undercut both AbbVie's (NYSE: ABBV) Viekira Pak and Gilead's Harvoni on wholesale price. That strategy could give payers the leverage necessary to negotiate steeper discounts with both AbbVie and Gilead going forward. What kind of drop-off is the market predicting? While it's difficult to estimate, given the large number of moving parts involved in Gilead's overall value, there's no doubt that the market is forecasting a significant decline based on how it's valuing the biotech as a whole right now. In short, the market seems to be assigning Gilead's current financial position, as well as its broad clinical pipeline, little to no value at the moment. Data source: S&P Global Market Intelligence. Figures are for the most recent quarter. As the above table shows, Gilead has arguably one of the cleaner balance sheets among its closest competitors, with the sole exception of Merck. After all, Gilead sports far less leverage than either AbbVie or Celgene (NASDAQ: CELG). Yet the market is still applying a markedly higher multiple to both AbbVie and Celgene's shares at present. Turning to Gilead's pipeline, the biotech currently sports at least 10 late-stage product candidates across a host of high-dollar indications, such as cancer, cardiovascular disease, HIV, and of course, hep C. While none of these experimental product candidates are on par with Harvoni from a commercial viewpoint, Gilead's late-stage pipeline isn't exactly being blown away by those being developed by AbbVie, Celgene, or Merck. In fact, Celgene and Merck's most valuable clinical assets in immuno-oncology are still in early to mid-stage testing for the most part, which is arguably the case for Gilead's highest-value product candidates as well. Now, truth be told, Gilead's oncology pipeline probably isn't as exciting AbbVie, Celgene, or Merck's, especially when it comes to more advanced product candidates. However, Gilead's lack of a broad immuno-oncology platform shouldn't be enough to drive such a large valuation gap -- at least not from a rational perspective. And still, there it is, in black and white. Is the market's pessimism warranted? I'll be the first to admit that predicting the future of a market as large and complex as hep C is next to impossible. Several big pharmas and blue-chip biotechs are angling to break into this market with novel products that can cut into Gilead's dominance, and there's no reliable way to forecast which companies will ultimately succeed in this effort. That said, I believe that further price cuts are inevitable as a result of this continued innovation surrounding hep C. Of course, Gilead could make up for any additional price declines via higher patient volumes, but that storyline won't last forever. Because these next-generation hep C treatments are essentially curative, and the hep C market has been naturally waning among Western nations due to the implementation of better blood-screening procedures, this particular drug market may not be able to support multiple blockbuster products for very long. And my gut feeling is that this is the main reason why the market is so skeptical about Gilead's top line moving forward. Unfortunately, I happen to agree with the market. After all, the market likes to see expanding margins and rising volumes for pharma products, which appears to be the exact opposite of where the hep C market is headed within the next three to five years. Looking ahead, I think Gilead needs to break into a major drug market other than infectious diseases to create long-term value for shareholders. The problem is that the logical place to look is the emerging immuno-oncology space -- but Gilead is so far behind the leaders in cancer immunotherapy, like Celgene and Merck, that it may not be worth the time and effort to try to catch up. Viewed this way, Gilead may be forced to break with its tradition and finally explore a megamerger to take the necessary leap into immuno-oncology in order to be a viable player. Until a large M&A deal comes to pass, though, investors probably shouldn't expect this biotech stock to rebound, given the strong headwinds the hep C market is facing right now.